If You Like the “Cash for Clunkers” Failure . . .
Last night, the federal government–after months of marketing and pouring gazillions into it–suspended the “Cash for Clunkers” program after less than four days of its existence. The cash–several thousands dollars in subsidies for trading in your less fuel-efficient car for a new one that’s more so–was supposed to last until the end of the year. But, instead, the $950 million dollars budgeted for the program has run it. The program’s been frozen. And the Obama White House is struggling to find a way to get it to continue. And you want to trust your healthcare–your very survival and the wellness of your body, limbs, and organs–to these same people. 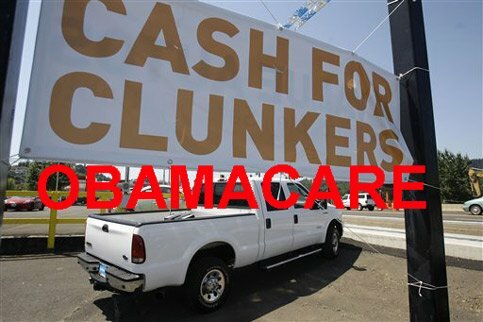 Sorry, but Cash for Clunkers is a very good preview of what will happen in Obama Clunker Healthcare for Americans. The Obama administration has already demonstrated they don’t know the real cost of that healthcare. They’ve underestimated the cost to a ludicrously low proportion of the real gargantuan cost. They underestimated the demand for “Cash for Clunkers” . . . just like they have for ObamaCare. Hey, when the government is paying for it, everyone with a paper cut or a head cold is gonna be crowding the doctor’s office waiting room. When the money runs out in four days, what is Obama (or whoever is President then) going to do? And, more importantly, what are you going to do? Imagine on the fifth day–after the money has run out–you get into a horrible car accident and your body is mangled. You need emergency surgery. But, hey, the money ran out last night. The emergency rooms are empty while President Obama tries to ride Congress to give more money to keep the healthcare program going. But in the meantime, you are dying. Well, don’t wait for “Clunker Healthcare for Americans” to find out. I guarantee it doesn’t end happily. At least, not for you. This is what happens when you promise the world, tell everyone what they want to hear, spend more time reading from your teleprompter and less time actually understanding the situations will get you. Four days, and 1 billion dollars more in debt. What’s amazing is people actually voted for an imbicile who has never held a job, has never written anything of substance, and has refused to release any documentation concerning his past. The only truth we know about him is he was a coke and pothead while the rest of his peers actually went to class and got jobs upon graduating. Like you said, what’s going to happen when private insurance is gone due to the mandated communist plan and when the country is bankrupt no one will have health care. Six months and I’m still waiting for all those millions of jobs that were supposed to be created through the trillion porkulas plan. They can’t even come up with a definition of what a “green” job is. Must be all the “green” icons people are using in support of Iran. Let’s think about the numbers associated with the ‘Cash for Clunkers’. They allotted $950,000,000 for this program. Even if they gave $4,500.00 for each car, that turns out to be a total of 211,111 cars turned in under this program. With a total of ~ 238,000,000 cars on the road today, as cited in money.cnn.com, this is only 0.09% of all cars on the road. Didn’t the people who started this program do the numbers? Did they expect only this tiny percentage of cars to be turned in? What morons. As to health care, let’s do the numbers for the Health Care bill in Clowngress. If they get the estimated $1.0 trillion over 10 years to cover this (which is on the low side of their best “Guess”), and there are ~ 300 million people in the U.S., that comes out to an estimated $333.00 per person per year to use on your personnal health care costs. How ridiculous is this very low number? All you need to do is catch the flu and brake your arm in one year and you have exceeded this amount. I guess they will just give you a pain pill and not treat your broken arm. These idiots in Clowngress are such fools!! You are quite right. If the Federal government tried to take at least a quarter of the used cars off the roads, the amount needed would greatly exceed the entire NASA budget. I have a feeling that Congress has negligently trapped itself into a new entitlement program for car dealerships. That is if you are assuming that the heath care plan is like Medicare or Medicaid, where it is completely supported by tax dollars. This is not true though, the government would act as a insurer asking you to pay copay and a monthly payment. Umm conservatives have been saying that it wouldn’t work, even attract anybody. First of all it shows how far off their judgment was. Secondly, it is a program that in the end has tons of benefits. So tell me again how this was and is a botched idea? Well said Max. It’s funny how they cannot admit when a gov program works. I didn’t realize that we had this many anti-Americans in our country. At least not that many with computers and electricity. I can’t believe that out of stimulus bill, climate change bill, and health care which all have been hot topics and can understandably be debated but this is amusing that such a popular program is getting attacked. It’s almost a no-brainer, help it keep going. On the other hand, I’m surprised as you are that this many people have access to the internet, even make a website like this. Makes me feel uneasy that this much hatred exists. When gas was $4 a gallon, i turned in my van for a smaller, more fuel efficient car, i didn’t need a $4,500 incentive, but like most people would take the money if it was offered, my first thought was, dang i missed that give away, my second thought was, wow, that’s going to cost tax-payers a lot of money to fund, and low and behold, it is not a sustainable program. It is not really a program, but a gimick. Also. if it did continue, it would hit the working and lower middle classes between the eyes. The cars collected for this program are not resold, but scrapped. This reduces the number of used cars available for purchase by the less well off, and thus increases their price. Also, under this program, cars must be crushed and shredded, and this hurts small auto recycling businesses that would normally obtain parts from such vehicles. In short, this program is an incredible waste that forces the poorest people out of automobiles entirely(over the long run), while pressuring others to buy an unnecessary new car at great expense and new debt. The class bias here is plain to see. Hey Max why are we dependent on foreign oil when we have the larges reserves of natural gas and oil? Because we have people that don’t know crap. Do you have a clue how much oil is draining into the ocean in California everday from natural leakage? Hey what will we call this other farce Global Climate change next year methane BS change. A couple of things Jarhead and Doug. 1. I agree foreign oil is bad and oil from home is better, but just because we drill in Cali or drill in Alaska won’t make us stop being addicted to it and always wanting more. We need to cut back totally push other forms of fuel, primarily electric, but the oil companies won’t let us so we need to force it through government. 2. Climate change is real. Global warming is real. (global warming means the world gets warmer and screws up temperatures, so where it is hot it gets warm, where it is warm it gets cold) Check that the few that say global warming does not exist work for agencies sponsored by oil money. 3. Energy efficient light bulbs are more efficient, but they help the environment, they help your electricity bill, and they last way longer than traditional light bulbs. If government pushes that I believe its a good idea. 4. I love capitalism. It is the best form for an economy. The conservatives want you to think its the country is becoming a communist nation. But we need rules to help us. After the great depression everyone sat down and made rules so that it couldnt happen again. Under Bush, Cox the head of the SEC took out those rules in name of capitalism and free market and we ended up having a meltdown. That is one example how government has to play the referee. In terms of bailout, the government saved the financial industry from collapse. You argue, what collapse? well lehman brothers failed without help from the govt and it created havoc, they knew it couldn’t happen again. Now the banks like Goldman and American Express just paid us back with interest, while savign the economy, we made a great deal. My point is I hate socialism but some things left to capitalism need to have rules. Healthcare should be a right like the police, the firemen, the army. Instead the insurance companies’ CEO take home millions, and then spend millions on advertising and then make our premiums go up. Something is wrong. If the premiums got lower then I don’t think we should need reform, but now we do. So what is next? Will the government subsidize my buying more efficient light bulbs? Will they subsidize all of the other items that I need to be more fuel efficient? Sure doesn’t sound like the capitalist country I once knew. The government needs to stay out of these misadventures. We need much less goverment intervention, not more. How do you like paying for other peoples cars, Comrade? Your tax dollars hard at work. I bought a Dodge Magnum with the Big American Hemi 5.7 liter, 350 horsepower engines. One of the many reasons I did this is because we won’t be able to buy this kind of vehicle soon. I also bought it because I refuse to let all those green weenies dictate to me what kind of car I can buy. You should have seen me on the highway other day zoom past one of those Matchbox Smart cars. It had a couple of people in it, and couldn’t accelerate worth a damn. It probably took it 2 minutes to get up to the speed of the other traffic. They are actually a very big hazzard to the other cars on the road. I bet those hamsters under the hood of that Smart Car really get burned out trying to accelerate to keep up with the rest of the traffic. You’re really cool man! You sound like a idiot teenager. Is your BIG Hemi making up for some other shortcoming? Perhaps your intellectual capacity? 1. There is NOT a major oil company conspiracy stopping alternative fuel research, it’s a developmental process that still needs refining. The first PC’s were the size of garages, now you can browse the web from a cell phone. Technology takes time to refine for practical use. Subsidizing new car sales is not the governments job. If the government can’t run something as simple as a car trade-in program, how can it run a complicated industry like health care? The government is incompetent at doing small things; just imagine the level that rises to when it does try to manage the health care industry. No wonder people don’t care for ObamaCare! 2. Climate change is a natural process, there have been periods of extreme heat and cold throughout history. 3. Energy efficient light bulbs are currently being banned from normal disposal methods (ie garbage/recycling) due to the effects on the environment. 4. It was Clinton’s interference into banking that created a bulk of the financial crisis. When banks are FORCED to lend to people based on factors other than credit worthiness it creates a distorted marketplace. Thanks to government ‘fixing’ accepted lending practices, the real estate market experienced a false increase in demand and thus pricing and thus lending. 5. I realize you didn’t break healthcare reform (communist takeover) into a seperate point, but I couldn’t figure out how to merge it into the real estate bust. Based on the efficient manner that government already handles Medicare and Medicaid, even YOU should be able to see the end result. Aside from the inability of government to make anything efficient, the complete disregard for the constituion is the real factor here. You are correct that the Army is a right, actually it is a required function of the federal government to maintain a strong national defense, but Police and Fire Protection are provided at the state, county and city levels of government. As far as healthcare being a ‘right,’ how can it be a ‘right’ when the rationing and refusal of treatment for high-risk patients (premature children and the elderly) is the accepted practice in single-payer sytems? A ‘right’ is something that cannot be rationed or taken away, it is an absolute. Reform for healthcare is pretty simple, tort reform by itself would gratly reduce all costs associated with medical care. When I was born my father paid $275 cash for the entire procedure at a county hospital, nowadays doctors and hospitals have to practice defensive medicine and pay huge malpractice premiums to protect themselves from the ‘jackpot jury’ seeking ambulance chasers. Two reasons why it does. 1. Our troops get it. They never have complained about it, they never went looking for private insurers. We all deserve that care. The troops deserve it sure but we should pay them even more for their services. 2. Yesterday no one in the House voted against repealing Medicare. A Democrat from New York pushed the legislation to see if the conservatives would really come out and say that government health care did not work. They didn’t because they know it is a good idea. Plus lets face it. The insurance companies make money off of us, they pay their CEOs millions, they pay millions for advertising on TV and paper, and then our premiums go high, and in the end of the year they turn a profit. Excuse me, but why doesn’t a government plan come in, covers everyone, can keep the profits, keep money from advertising, pay the highest guy $200,000 and all that money goes right back into the system. You speak of tort reform, but lets be honest, has your doctor ever gotten sued? More than usually for the bare necessities like drugs and basic medical practices no one gets sued. You can’t tell me thats where the answer to the problem lies, its not that easy. Just that everyone wants to turn a profit and a high one at that. 1. Just because there is a VA, doesn’t mean that it’s the first choice by our soldiers. I don’t know how much military history you have in your family, but from my experience I will use private insurance and doctors ahead of a VA benefit. My private doctor will not put ‘patient was uncooperative’ as the reason for not treating my newborn with a 101 degree temperature. 2. Not voting against Medicare is self preservation. Retired people are the most active voting block. The numbers and impending bankruptcy of Medicare are a more true gauge of how well it works. We haven’t even touched on the amount of abuse and fraud that are prevelant. I come from a family of entrepreneurs, let me enlighten you on a some of the frivolis lawsuits I have seen. My family has been sued by a woman who arrived drunk and fell out of her own car, then attempted to claim we served her and she was leaving. Second case, a woman got her hair caught in an automatic door closer and sued for emotional damage from having to cut it to get her loose, it wasn’t until the hair was examined at trial we found out it was a wig. Third case, an elderly woman stepped in a pothole on a public walkway coming to our establishment, her husband sued us for causing emotional neglect because it affected her ability ‘perform her wifely duties.’ This was in one 5-year span of owning a bowling alley, do you actually believe a profession that affects life and death daily would see less? As far as ‘Excuse me, but why doesn’t a government plan come in, covers everyone, can keep the profits,’ it’s unconstitutional. Where am I as a productive member of society (as in I actually pay a federal income tax) required to provide health care for you? Furthermore, I would prefer the government not have the right to regulate anyones lifestyle, which will eventually have to happen to keep the program solvent. Do you want the government telling you that driving a motorcycle, exceeding height/weight standards or your sexual preference deem you as high risk and disqualify your ‘right’ to medical treatment? Aside from the constutionality issue, based on the the amount of fraud and inefficieny in the current governmental programs, how could there ever be a profit? Furthermore, a governmental program will eventually drive the free market insurers out of business, thereby lowering the standard of care that people from all over the world currently come here to receive. Back to your original post ‘I love capitalism,’ let’s review that statement. Insurance companies make millions – true, but we have the ability to change providers. This is true with all types of insurance, even health. Just as a good driving record can get better auto rates, staying in decent shape gets better health rates. You ended you last post with ‘Just that everyone wants to turn a profit,’ that’s the basis of capitalism, the ability to profit from labor and intellect. Since your last post questioned why tort reform should be the starting point, I’ll explain. 1. Doctors and hospitals pay malpractice insurance premiums. These premiums are added into the cost of services. 2. Pharmaceutical companies are regularly sued for an adverse effect of a drug. These lawsuits are paid by raising the end cost of drugs. 3. Consumers pay health insurance premiums. These premiums increase in relation to the cost of services from doctors and hospitals and the cost of pharmaceuticals. This is not the only thing needed, but it is a good starting point. I believe that some regulation of insurance companies is needed, but I have severe doubts in the abilities of Congress to be able to multitask. Both of these have been suggested and then squashed, primarily because of the amount of lobbyist money involved with insurance and lawyers. We currently have the best healthcare available in the world. Even if you do not have insurance, you can go to any emergency room and they are REQUIRED to treat you (legal citizen and illegal alien alike). No one is going without, as they are in Canada and GB. I really can’t believe that he tried to cite the V.A. as a satisfactory medical provider. It seems that he has never had to access their services. Most veterans I have known have opted to enroll in private insurance plans, rather than deal with the “free benefit” that they have earned. I have a friend who has had to wait months for a marital counseling appointment with the V.A. This same appointment would have been given by my H.M.O. in 2-3 weeks tops. How good is a benefit that you cannot access in a timely manner, when you really need it? You’ve got to be kidding me about the medical care supplied to our troops. Most of the doctors in the military are two types: 1) The people who got their education through the government paying for their college and they must give back to the government or 2) Quacks who couldn’t hack it in civilian practice. When I served in the Marines, I separated my shoulder. I went to the infirmary to get it looked at, and a Navy doctor took some X-rays and said it was dislocated. While we waited for the civilian orthopedist, this so called doctor loaded me up full of morphine and he tugged and pulled on my arm to try to get it back into place. The civilian doctor showed up, just took a rudimentary look at my condition and began to berate the Navy doctor because my shoulder was separated, not dislocated. It would never go back into place, and the civilian doctor said he probably made it worse. Don’t even get me started on the VA hospitals. They are death traps. I went to the one in Philadelphia, and they have a cemetary right next to the hospital. I was surprised they didn’t just have a shoot pointed at the empty grave sites. I have a friend in the auto business. He says the so-called “clunkers” he’seen in the last few days have all been decent, clean cars with plenty of life left. He said most of them probably would have sold-by-owner for more than the credit they got as a “clunker” trade in, but people didn’t want to bother trying to sell them themselves. He said these vehicles cannot be resold by the dealer. They must be destroyed, mashed flat in a junkyard. So much for being “green”. This hypocracy is unbelievable. All this program does is hand money to people who can still qualify for payments on something new. It does nothing for the un- or underemployed or the poor, and it sure as shootin’ does absolutely nothing for the environment. Debbie, I Love your new site !! But I think I smell a rat. It looks as though some posers from the leftist hate blogs have decided to latch on your blog to pontificate. Oh, and by the way, they are Blog Hogs. Just going on and on. The dead give away was when Debbie says she is for limited government, freedom of choice in Healthcare, development of America’s natural resources, prudent fiscal policies,etc. and all these posers can whine is the left’s mantra, “You people are haters” Hilarious. Keep speaking the truth Debbie. Even if it hurts. This helps those who could buy a new car anyway, but it take’s the used cars off the market so the less fortunate can’t get a used car to find a job or get around. This will also trickle down to the repair service as there will be less to fix. Why should my tax money be used for someone else to get a new car when I can’t afford one. This should make the Obama-let auto dealership look good for quarterly sales and prove that his auto bailout worked at the exspence of the tax payers. If Obama really want’s to help with fuel consomtion then stop running here and there and get to work. Now on healthcare, I would challenge all of congress to sample the heathcare plan for two years prior to handing it to us. Form your plan, use it just the way you would like us to and then try again to sell it to us. I know Obama say’s he has health insurance and he is doing for us, well then he should use the healthcare plan he want’s us to use. Try putting the cash for clunker money back into the social security program that the government has fleesed over the years and maybe the system won’t look so broken. 1. Medicare & Social Security: In the ‘60s the government decided SS had plenty of money to fund SSDI. At sometime, I believe it was in the ‘80s, the government started to “borrow” from SS to fund the Federal Government with a promise to pay back the money with interest, which they did not do. Also, Reagan’s answer to make SS viable was to raise the age for full retirement benefits. Now there are reports that, since SS is running out of money, the government has been borrowing from Medicare. One thing is surely true and, has been reported in the general news media, is that wide spread fraud in the billions of dollars exists in both Medicare & SS. Once again, the government wishes to blame the senior and, has convinced a lot of people that the senior is to blame, instead of looking at where the real problem exists. 2. Medicaid: Under what conditions will those who are now Medicaid recipients receive End of Life Counseling and denied further treatment? Presently there is no cure for Multiple Sclerosis; will Cancer victims be included; Obesity carries a number of health risks; who gets Organ Transplants. 3. End of Life Counseling: I don’t think so, not by the Federal Government. Presently hospitals and hospices have these services available, not to mention that, in cases that I am aware of, it is not the senior that needs End of Life Counseling, but the loved ones that are left behind. 4. To the Young or Younger: While this may be a distance thought to you, you will one day be affected by what happens today. 5. Why is the President and Congress exempting themselves from Obama’s Healthcare Plan. If it is good enough for me, then it should be good enough for thee. And we want the Federal Government in charge of healthcare? I don’t think so. Anybody know why Obama never misses a chance to remind us that he is President? First of all, I need that Hemi to pull my trailer. Secondly, do you think I am stupid because I served in the Marine Corps? Well guess what Mike. I graduated from Villanova University with an Electrical Engineering degree with a 3.45 GPA and 18th in my engineering class. What does wasting money on such farcical programs have to do with hate? Also, you seem quite enamored with Congressional wisdom. Anyone can get more money by overdrawing their checking account or credit card, but there are consequences. Finally, did you graduate from elementary school, or are we witnessing the end phases of drug abuse in your writing? I go to the local salvage yards 2 times a week to get parts and our local Pull-A-Part here in Indianapolis has many of the clunker cars. The thing that is sick is seeing these cars in the junkyard. Out of 87 cars and trucks and suv’s I only saw 1 crappy S10 Blazer that was a rust heap. All others were beautiful cars and trucks. One of the ones that made me mad was a 1998 Nascar F150 truck that was all original with 47k miles on it. This truck had the big V8 and even had a Roush Racing supercharger on it. Others were Suburbans 2 wd and 4×4’s ,89 Corvette,99 Volvo,Many Caravans and even a 2003 Chevrolet Venture Warner Bros Edition. But the real silly thing is if you look up Kelly Blue Book on these cars 80% are higher than what Osama/Obama gave these people in trade in.